John Healy is the principal guide at Simply Mountains. He has been hillwalking, rockclimbing, and mountaineering for almost 2 decades and has worked fulltime as a guide and instructor since 2002. Over the course of this time he has trekked and climbed in North and South America, Alaska, New Zealand, and extensively in the European Alps , Britain and Ireland. Despite spending most of his working time on the hills, mountains, and cliffs, it is also where he will be most likely found on his days off! 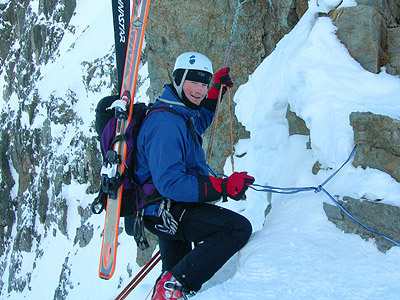 His mountaineering CV covers a broad spectrum of climbs, including many summer and winter alpine climbs, skiing and ski-touring, as well as first ascents in both Rock and Ice-climbing in Cork, Kerry and Connemara... and occasionally skiing down Irish Mountains! While at home working anywhere in the mountain environment, John is particularly passionate about teaching others the skills to become independent climbers and walkers. Whether you join us on an instructional course or to be guided on one of Irelands classic walks or climbs, you are sure to enjoy and benefit from his comprehensive experience and knowledge. John is a qualified 'Mountain Leader' and Rock Climbing guide, and all of our courses are run by qualified and insured instructors or guides.